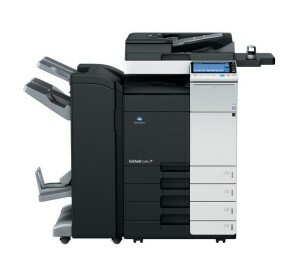 Konica Minolta Bizhub C284 has some of the fastest output speeds of all the Arizona copiers on the market. The pages will output at 28 ppm. When you’re printing large jobs, this’ll make a huge difference. Employees will be more productive when they are not spending a majority of their time sitting in front of the copier waiting for documents to print. Konica Minolta Bizhub C284 Features Superior Color if you want professional copies with vibrant colors and crisp resolution, choose the Konica Minolta C284. This is one of the best Arizona copiers for achieving the richest array of colors available. For presentations, superior colors will capture the attention of your audience faster, and you’ll be more likely to win business. Scanning documents is necessary in business. When you need to send attachments or need to share a hard copy, scanning is preferred. The flexible scanning feature is capable of scanning up to 160 originals per minute. Fast scanning makes your business more efficient. Konica Minolta Bizhub C284 Features Auto Finishing auto finishing is a way to make your documents look professional and desirable. Most people are impressed with the documents produced from the auto finishing feature. One toner cartridge will produce 27,000 pages and the auto finishing has a similar life-span. They’re optional. Add them only if you want to create the “wow” factor. The touch and swipe interface of the Konica Minolta Bizhub C284 makes it easier to operate. Most of our customers at Arizona Copiers understand this technology and prefer it over the standard manual buttons. If you want efficiency and ease, a touch and swipe interface is something you should strive for. Konica Minolta Bizhub C284 as your preferred copier if you’re in the market for copiers, won’t find any one better than Arizona Copiers when it comes to the Konica Minolta C284. The number of features is impressive, and many people enjoy what Konica Minolta has produced for its customers. We think you’ll be pleased with our selection of products and customer service.